The ongoing bullying problem in America just got a huge lift from a an unlikely source. Dogs! That’s right. A retired school teacher Jo Dean Hearn started created her “No More Bullies” program five years after her career as a teacher ended. The curriculum, developed by ex-teacher Hearn and humane education director at animal rescue group Wayside Waifs, is presented an hour a day for five days by trained volunteers — accompanied by irresistible canines. We just thought to share this wonderful piece of news today. 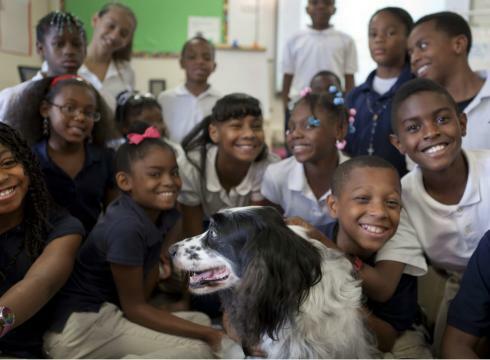 It’s nice to know that the incredible effects dogs have on us humans can work to benefit a children’s life in school. Clearly bullying has become a prevalent topic in today’s society and any form of relief is welcomed. Especially with the use of K9s! Hi there! Simply wanted to say i always enjoy your complete posting style and also I’ll look at webpage frequently from now. Keep publishing.